In 1898, Archbishop Patrick John Ryan (1831–1911) canonically erected Philadelphia’s first shrine, Our Lady of Victories, in St. Peter Claver’s Church. Named for Peter Claver (1581–1654), a Spanish Jesuit missionary who worked with enslaved people in Colombia, St. Peter Claver’s Church served the black Catholic community in Philadelphia throughout the twentieth century. 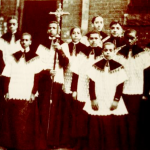 Established in 1892 in response to discriminatory practices faced by black worshippers in other churches, St. Peter Claver’s became a place where black Catholics felt at home. The parish and school, located at Twelfth and Lombard Streets, had been purchased with the help of St. Mary’s and Holy Trinity churches and Katherine Drexel (1858–1955), a nun dedicated to serving black and Native American communities. In 2014, the doors to the church and shrine closed after a bitter struggle due to priest shortages in the archdiocese and increasing gentrification of the city. Born and educated in Bohemia (now part of the Czech Republic), John Neumann (1811–60) left his home when an overabundance of priests prevented his ordination into the priesthood. 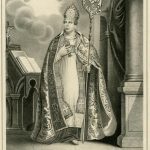 In 1836, he arrived in New York, where Bishop John Dubois (1764-1842) ordained him. Four years later, yearning for greater community, Neumann received permission to join the Redemptorist Fathers. He became known as the “Immigrant Shepherd” for his instrumental role in developing the Catholic faith for immigrants. 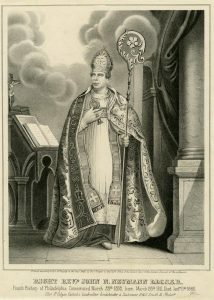 He succeeded Bishop Francis Kenrick (1796–1863) as the fourth bishop of Philadelphia in 1852. During his tenure, Neumann established the first diocesan school system in the country. He also played an indirect role in the creation of a shrine in Allentown, Pennsylvania, where, in 1857, he founded the city’s first Catholic parish, the Church of the Immaculate Conception of the Blessed Virgin Mary. Following his death in 1860, the Crypt of St. Peter’s Church at Fifth Street and Girard Avenue, which housed Neumann’s body, became a site of pilgrimage. After his canonization in 1977, the church constructed the National Shrine of St. John Neumann at St. Peter’s to honor the first male American saint. Katherine Drexel (1858–1955), daughter of Philadelphia financier Francis Drexel (1824–85), dedicated her life to philanthropic work. In 1884, she traveled west with her family and witnessed the horrific conditions of Native American reservations. Following her father’s death in 1885, Drexel used her inherited wealth to establish schools for black and Native American communities throughout the western and southern United States. 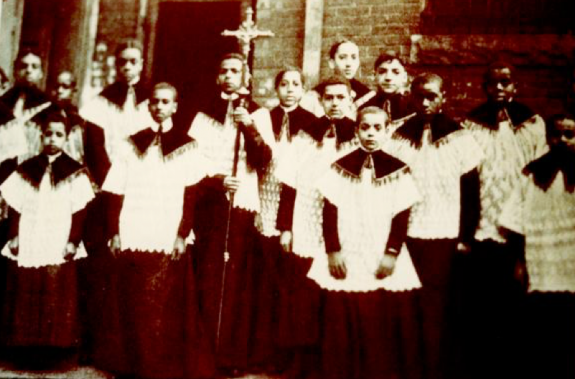 In 1891, Drexel took vows to become a nun and founded the religious order of the Sisters of the Blessed Sacrament for Indians and Colored People (now the Sisters of the Blessed Sacrament) in Pennsylvania. Though the community received papal recognition in 1913, by the end of her life, Drexel had contributed more than $12 million of her own wealth to fulfill the order’s mission. 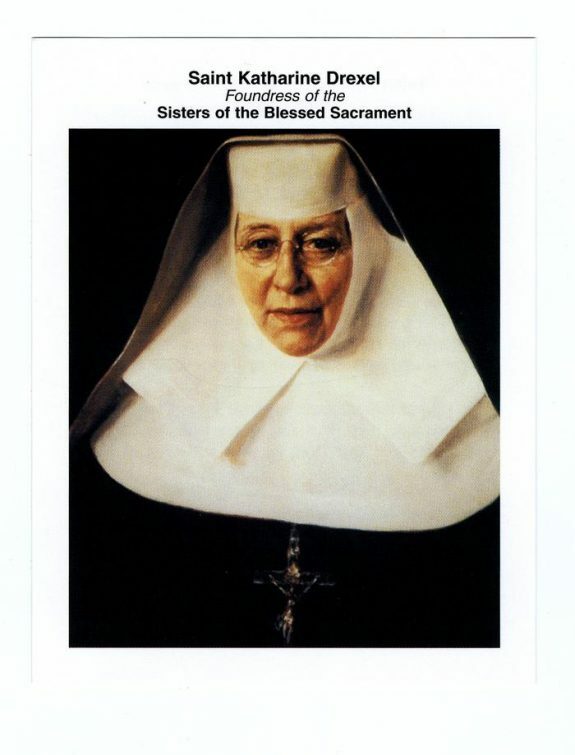 By the time of her death in 1955, the Sisters of the Blessed Sacrament had established fifty-one convents, forty-nine elementary schools, twelve high schools, and Xavier University. Drexel was canonized the second American-born saint in 2000, and a shrine was created around her interred remains in St. Elizabeth Chapel in Bensalem, Pennsylvania. Facing declining membership and financial pressures, the Archdiocese of Philadelphia sold the Bensalem property in 2018, and plans called for moving Drexel’s remains to the Cathedral Basilica of Saints Peter and Paul in Philadelphia. She has become the patron saint of racial justice and of philanthropists. Father Joseph Skelly (1874–1963) was appointed prefect of St. Vincent’s Seminary in the Germantown neighborhood of Philadelphia in 1900. While raising funds in 1912 for the construction of a minor seminary in Princeton, New Jersey, he placed a small Miraculous Medal in each appeal letter, in memory of a medal his mother gave him as a child. The response to his appeal was so generous that he felt a special gratitude to the Virgin Mary. 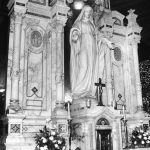 In 1927, when the congregation enlarged the Chapel of the Immaculate Conception at St. Vincent’s Seminary, Father Skelly used a section to create Mary’s Central Shrine, also known as the Miraculous Medal Shrine. 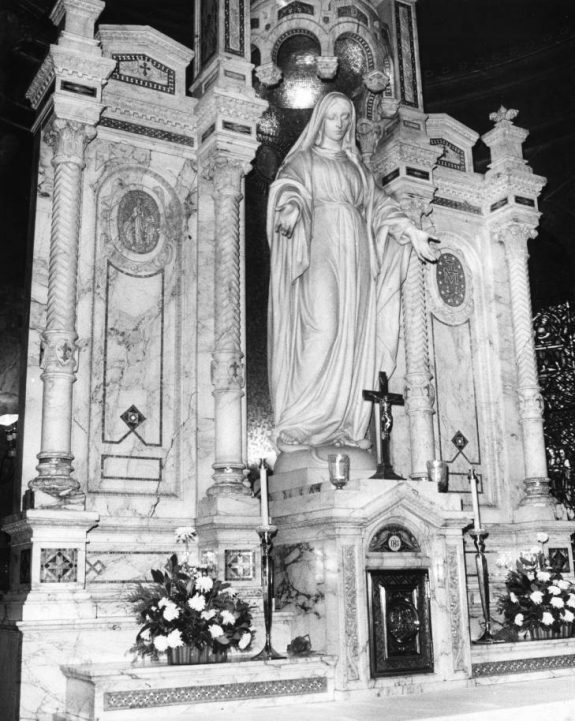 In 2000, the Archdiocese of Philadelphia designated the shrine as one of six official pilgrimage sites, and by 2002, the Miraculous Medal novena—a series of special devotional prayers developed by Father Skelly—had become the most popular novena devotion in the region. Father Skelly died in 1963 and was interred in the shrine’s crypt. People of faith have long revered significant religious sites, making pilgrimages for special devotion to locations that often developed into formal shrines–places regarded as holy because of their associations with sacred persons, relics, or events. Beginning in the mid-nineteenth century, Roman Catholic churches and other faiths in the Philadelphia area established a number of shrines, often in response to changes in ethnic populations or in recognition of influential individuals. The shrines have drawn people to the region from around the world. Despite sometimes-violent nativism and anti-Catholicism in the Philadelphia area during the nineteenth century, Catholics came to the region in great numbers, and the Catholic Church built up parishes and a strong Catholic institutional structure. Such efforts also led to the establishment of shrines, where Catholics might practice devotions as well as reflect on and renew their faith. In 1898, Archbishop Patrick John Ryan (1831-1911) canonically erected the first shrine in Philadelphia–The Shrine of Our Lady of Victories in St. Peter Claver’s Church. Named for Peter Claver (1581-1654), a Spanish Jesuit missionary who went to Colombia to serve the slaves, the church at Twelfth and Lombard Streets was a place of worship where black Catholics felt at home. A little over one hundred years later, the doors to the church and the shrine closed due to the priest shortage in the archdiocese. Other shrines proved more enduring and attracted pilgrims worldwide. The National Shrine of St. John Neumann established at St. Peter the Apostle Church honored Bishop John Neumann (1811-60), who led the Diocese of Philadelphia from 1852 until his death. Known as the “Immigrant Shepherd” for his instrumental role in developing the Catholic faith for immigrants in Philadelphia, Neumann was running an errand in January 1860 when he collapsed in the snow not far from his new cathedral on Logan Square. The Crypt of St. Peter’s Church at Fifth Street and Girard Avenue, where Neumann’s body was placed (following his request), became a site of pilgrimage. After Neumann’s beatification by Pope Paul VI (1897-1978) in 1963 and canonization in 1977, the Church constructed the National Shrine of St. John Neumann at St. Peter’s with the remains of the saint lying under the altar. Neumann also played an indirect role in creating a shrine in Allentown, Pennsylvania, where in 1857 he founded the town’s first Catholic parish, the Church of the Immaculate Conception of the Blessed Virgin Mary. In 1974, having considered forty-two North American churches, an episcopal committee of the National Conference of Catholic Bishops selected the site for the National Shrine of Our Lady of Guadalupe and installed a life-size replica of Our Lady of Guadalupe’s tilma (apron) image in the church sanctuary. It chose Allentown because of its distance from Mexico, which allowed those who would never travel to Mexico the opportunity to visit the shrine, and because of the parish’s devotion to Mary, the mother of Jesus. In Doylestown, the National Shrine of Our Lady of Czestochowa, known as the “American Czestochowa,” developed from the work of a Polish priest, Father Michael Zembrzuski (1908-2003), who traveled to Polish parishes throughout the United States to preach in the early 1950s and dreamed of building a shrine that would become a religious and cultural center. Our Lady of Częstochowa (Black Madonna), revered by the Polish people, is an icon of the Virgin Mary housed at the Jasna Góra Monastery in Częstochowa, Poland. In 1953, the Holy See gave Zembrzuski’s order, the Pauline Fathers, permission to establish a monastery in Doylestown. Less than two years later, Father Stanley Nowak (1902-1974) blessed and dedicated the monastery’s small barn chapel to Our Lady of Czestochowa, complete with a painting of Our Lady of Czestochowa by Władysław Bończa-Rutkowski (c.1840-1905). As time passed and people heard of the shrine, the small chapel proved insufficient for the needs of the larger community. In 1964, Archbishop John Krol (1910-96) led the groundbreaking ceremony for the shrine’s new foundation, which became a spiritual center especially for Polish-Americans. Other well-known national shrines in the Philadelphia area include St. Katharine Drexel in Bensalem and the Miraculous Medal Shrine (Mary’s Central Shrine) in the Germantown neighborhood of Philadelphia. 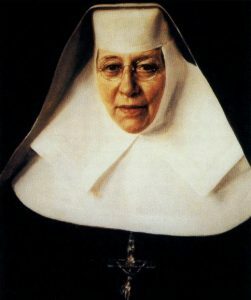 Katharine Drexel (1858-1955), a Philadelphia heiress, entered a convent in 1889 as Sister Mary Katharine and gave her millions of inheritance to improve the lives of blacks and Native Americans through missions and schools. Although she expressed a desire to live a cloistered life, Bishop James O’Connor (1823-90), a family friend and her spiritual advisor, urged her to found an order that would be active in the black and Native American communities. Less than two years later, she took her first vows as the first Sister of the Blessed Sacrament. The following year, she and thirteen companions moved to St. Elizabeth Convent in Bensalem, the site of the future shrine. 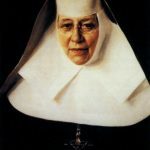 The shrine area, built in 1949, held Drexel’s entombed remains after her death in 1955 and offered the story of Mother Katharine Drexel (canonized St. Katharine Drexel by Pope John Paul II [1920-2005] in 2000) through a variety of artifacts. In 2016, in the face of declining membership and financial pressures, the Archdiocese of Philadelphia sold the Bensalem shrine but pledged to keep it open to visitors until the end of 2017. The next year, the remains of Katharine Drexel were moved to the Cathedral Basilica of Saints Peter and Paul in Center City Philadelphia. The history of Mary’s Central Shrine began in 1875, with the building of the Chapel of the Immaculate Conception attached to St. Vincent’s Seminary in Philadelphia. While Father Joseph Skelly, CM (1874-1963) served at the seminary, he received a special assignment in 1912 to raise funds for the construction of a minor seminary in Princeton, New Jersey. He placed a small Marian Medal in each appeal letter that he mailed. The response to his appeal was so generous that he felt a special gratitude to Mary. 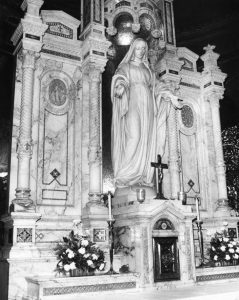 In 1927, when the congregation enlarged the Chapel of the Immaculate Conception, Father Skelly used a section to create “Mary’s Central Shrine,” also known as the Miraculous Medal Shrine. In the millennium year, 2000, the Archdiocese of Philadelphia designated the shrine as one of six official pilgrimage sites, and in 2002, it reported that the Miraculous Medal novena (special prayers for nine consecutive days) was the most popular novena devotion in its parishes. During the twentieth and early twenty-first centuries, Roman Catholics in the region also established the Rosary Shrine at the Monastery of Our Lady of the Rosary in Summit, New Jersey (1919); the Shrine of St. Joseph in Stirling, New Jersey (1924); the National Shrine of St. Girard in Newark, New Jersey (1977); the Shrine of the Immaculate Heart of Mary in Washington, New Jersey (1978); the National Shrine of Saint Rita of Cascia on South Broad Street in Philadelphia (2000); and the Shrine of Saint Gianna Beretta Molla in Warminster, Pennsylvania (2013). Many of the shrines in the Philadelphia area emerged due to the desires and growth of ethnic populations as with African Americans, Poles, and Cambodians, or they developed due to the leadership of personalities such as John Neumann and Katharine Drexel. Still others found their origins in the people of the parishes and their devotion to Mary and the saints. For a variety of faiths, shrines provided locales for pilgrimage, places for people to develop their beliefs and identity, and spaces of peace. Brenda Gaydosh is an Associate Professor of History at West Chester University. Her research focuses on varied aspects of the Catholic Church–from a biography about Nazi-era German Provost Bernhard Lichtenberg to how the Catholic Church has dealt with genocide. Ennis, Arthur J. Old St. Augustine’s Catholic Church in Philadelphia: Historic Shrine Established in A.D. 1796. Philadelphia: Old Saint Augustine Catholic Church, 1965. Laderman, Gary and Luis Leon, eds. Religion and American Cultures, 4 volumes, Tradition, Diversity, and Popular Expression, 2nd Edition. Santa Barbara, Calif.: ABC-CLIO, 2014. Moran, J. Anthony. Pilgrims Guide to America: U.S. Catholic Shrines and Centers of Devotion. Huntington, Ind. : Our Sunday Visitor, 1982. Tweed, Thomas A. “John Wesley Slept Here: American Shrines and American Methodists.” Numen 47, no. 1 (2000): 41-68. Printed materials,Philadelphia Archdiocese Historical Research Center, St. Charles Borromeo Seminary, 100 E. Wynnewood Road, Wynnewood, Pa.
National Shrine of Saint John Neumann, 1019 N. Fifth Street, Philadelphia. Saint Katharine Drexel Shrine, Cathedral Basilica of Saints Peter and Paul, Eighteenth Street and Benjamin Franklin Parkway, Philadelphia. National Shrine of Saint Rita of Cascia, 1166 S. Broad Street, Philadelphia. Central Association of the Miraculous Medal–Mary’s Central Shrine, 475 East Chelten Avenue, Philadelphia. National Shrine of Our Lady of Czestochowa, 654 Ferry Road, Doylestown, Pa.
Saint Gianna Beretta Molla Shrine, Nativity of Our Lord Parish, 605 W. Street Road, Warminster, Pa.
Khmer Palelai Buddhist Monastery, 2701 S. Fifty-Eighth Street, Philadelphia.